Abrogative Power of Later Courts. In Deut. xiii. 1 (xii. 32, A. V.) Moses is described as saying: "What thing soever I command you, observe to do it: thou shalt not add thereto, nor diminish from it." Taking this injunction literally, the Sadducees, and later the Karaites, rejected the rabbinical development of Judaism, as additions to and modifications of the Mosaic laws. But the injunction could not have meant that for all future time, without regard to varying circumstances, not the least alteration or modification should be made in the religious and civil laws established for the people of Israel. "According to the law which they shall teach thee, and according to the judgment which they shall tell thee, thou shalt do; thou shalt not depart from the word which they may tell thee, to the right or to the left." "From the Sanhedrin in Jerusalem, law and decision should go forth to all Israel. Whatever it taught either as tradition or by interpretation according to the hermeneutic rules, or whatever it enacted according to the exigencies of the time, must be obeyed." "Any religious court [kol bet din] has the power to set aside even a Biblical law as a temporary measure. If they find it necessary to suspend for the time being an injunction, or to permit one to act against a prohibition in order to bring the masses back to the Torah, or in order to prevent a greater evil, those in authority may do according to the exigency of the time. Just as a physician is sometimes compelled to amputate the limb of a patient in order to save his life and general health, so those in authority [bet din] may at any time decree the temporary suspension of some laws in order to secure the fulfilment of the religious law in general". Although Maimonides here refers only to the right of temporarily suspending a law, there are cases mentioned in the Talmud, as will be seen later, in which a Biblical law was entirely abrogated. Besides, the simile used by Maimonides in the passage just quoted applies rather to the abrogation than to the temporary suspension of a law; for the amputation of a limb to save the life and health of the patient is not a mere temporary separation. The Talmud contains the following maxims by which the religious authorities of various periods were guided in abrogating certain laws: "The abrogation of a law is sometimes equivalent to the maintenance of the law"; that is, to set a law aside is sometimes as meritorious as to establish it (Men. 99b). "It is better that a single law be uprooted than that the whole Torah be forgotten" (Tem. 14b). "There are times when the duty of working for the glory of God requires the abolition of a law" (Ber. 54a and 63a). "The court [the religious authority] may, under circumstances, decree to uproot a positive law of the Bible" (Yeb. 89b). In citing some examples of suspension and of abrogation of Mosaic laws in different periods, one may be recorded from the Bible. According to I Kings, xviii. 31, the prophet Elijah offered a sacrifice upon the altar erected on Mount Carmel. This was in contravention of the law in Deut. xii. 13, which forbade the offering of sacrifices outside of the central sanctuary. The rabbis defend the act of the prophet on the ground that it was a temporary measure necessitated by the circumstances (Yeb. 90b). Of more importance are the following cases of the abrogation of a Biblical law as stated in the Talmud: Ezra (according to Yeb. 86b, Ḥul. 131b) decreed that the first tithe should be given to the priests, contrary to the Mosaic Law in Num. xviii. 21, which ordained that they should be given to the Levites. In consequence of this abrogation another law had to be abrogated, namely, that which referred to the solemn profession which, according to Deut. xxvi. 12-15, every farmer had to make annually in the Temple; for the passage in this confession, "have given it [the tithes] to the Levite," could not any longer be said in truth (Soṭah, 47b, after Tosef., Sotah, xiii. 10). Hillel the Elder enacted a measure, termed Prosbul, which was tantamount to an abrogation of the Biblical law in Deut. xv. 2, concerning the release from debt in the Sabbatical year. Finding that this law, which was intended to benefit the poor, proved in the course of time rather a disadvantage to them, as no one was willing to lend them money lest he lose his claim at the approach of the Sabbatical year, Hillel, by virtue of his authority as head of the Sanhedrin, caused a law to be enactedby which the creditor could transfer the debt to the court in writing, so that the latter might collect it in spite of the Sabbatical year (Mishnah Sheb. x. 3, 4). See Accommodation of the Law. While the Sabbatical year, especially in so far as it concerned the fallow land (Lev. xxv. 3-7), was strictly observed during the period of the second Temple, and even after its destruction, there is no historical record of the observance of the jubilee year as ordained in Lev. xxv. 8-12. According to the Talmud ('Ar. 32b), the observance of the jubilee ceased from the time when the tribes of Reuben and Gad and the half-tribe of Manasseh were carried off by the king of Assyria. 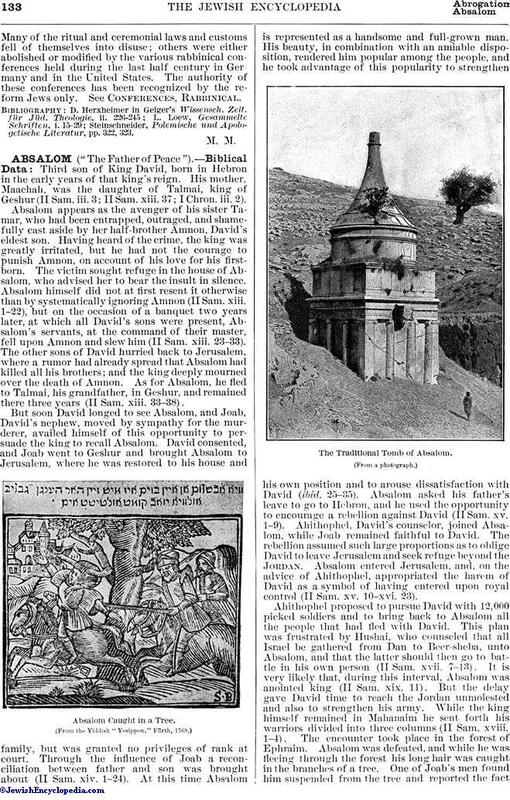 The Talmud justifies the abrogation of this Biblical institution by a rather too literal interpretation of the words in the law concerning the jubilee year: "And ye shall proclaim liberty throughout the land unto all the inhabitants thereof"; only when all the inhabitants were in the land was the jubilee to be observed, but not when some tribes were exiled from it ('Ar. ibid.). The abrogation of other Biblical laws on account of changed circumstances is ascribed to Rabbi Johanan ben Zakkai, as the abrogation of the water of the ordeal, ordained in Num. v. 11-31 for the trial of a woman suspected of adultery (Soṭah, ix. 9), and the abrogation of the solemn rite of expiation ('Eglah 'Arufah) for a murder the perpetrator of which is unknown, as ordained in Deut. xxi. 1-9 (Tosef., Soṭah, xiv. 1 and ibid.). In consequence of the destruction of the Second Temple by the Romans numerous laws were suspended, especially the sacrificial laws and most of the laws concerning Levitical uncleanliness and purification. The Sanhedrin of Jabneh, on the motion of Rabbi Joshua ben Hananiah, permitted an Ammonite to enter the Jewish congregation of Israel, thus actually abrogating the Biblical law in Deut. xxiii. 4 [A. V. 3]: "An Ammonite shall not enter into the congregation of the Lord." The reason for setting this Biblical law aside was that it was claimed by the rabbis that, in consequence of the conquest of the land of the Ammonites by Sennacherib, the real descendants of that nation could not with certainty be identified (Mishnah Yad. iv. 4). In connection with the above-mentioned cases in which Biblical laws were abrogated, the following one may here be referred to; though it does not concern any express Biblical law, it deals with one which was considered to have a Biblical basis. For many centuries it was regarded as a transgression of the Law to commit the traditional law to writing; it was to be transmitted only from mouth to mouth, and was therefore called the oral law, in contradistinction to the written Law contained in the Pentateuch. The purpose of this prohibition was probably that the traditional law should not be regarded as of equal sanctity with the Law of Moses. A Biblical basis for this prohibition was found in the passage of Ex. xxxiv. 27: "Write thou these words," etc. By emphasizing the word "these" the passage was interpreted to mean: "Only these words (of the divine Law) you may write, but not the traditional law." 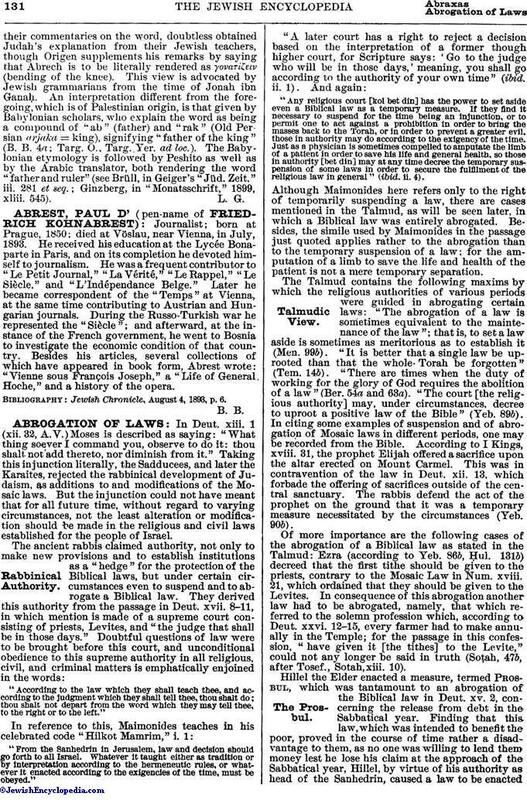 Nevertheless, when in the course of time the subject-matter of the oral law had accumulated to such an extent that it became almost impossible to preserve it by oral transmission, it was written down in the Mishnah and kindred works; and the abrogation of the prohibition so long regarded as Biblical is justified in the Talmud by a reference to the principle: "It is better that one law be set aside rather than that the whole Law be forgotten" (Tem. 14b). 1. Laws and customs, whether prohibitory or mandatory, if established by a former authority and generally accepted in all Israel, may only be abrogated by a later assembly that is superior to the former, both in learning and in number. By the latter term is meant the number of contemporaneous scholars endorsing the authority and the decision of that assembly. 2. Restrictive measures, however, which were enacted by a former authority as a necessary "hedge" to protect the Torah, and which have been accepted in all Israel, may not be abrogated by a subsequent though higher authority. 3. If it is found that such laws are not as generally accepted or as generally tolerable as was formerly supposed, a later though inferior assembly may abrogate them. 4. Every law, however, may be set aside temporarily by a minor authority, when it is necessary for the maintenance of religion in general ("Hilkot Mamrim," ii. 2-7). Mention may here be made of cases where the motives which had caused the enactment of a law have ceased to operate. 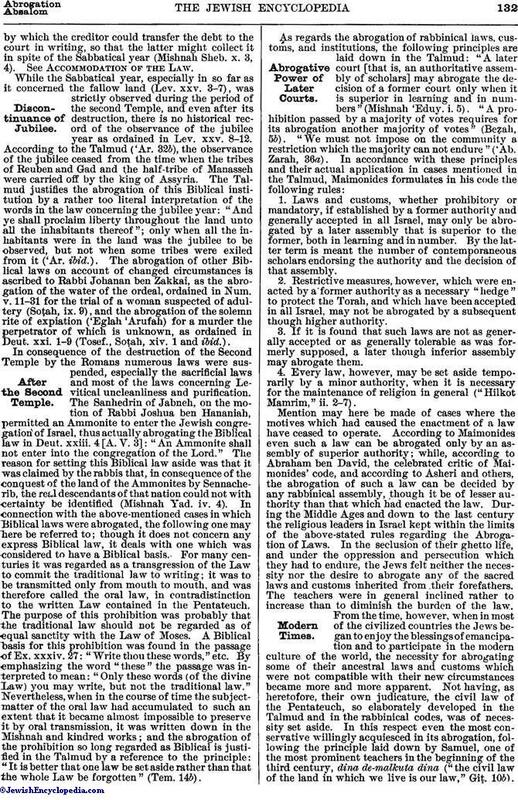 According to Maimonides even such a law can be abrogated only by an assembly of superior authority; while, according to Abraham ben David, the celebrated critic of Maimonides' code, and according to Asheri and others, the abrogation of such a law can be decided by any rabbinical assembly, though it be of lesser authority than that which had enacted the law. During the Middle Ages and down to the last century the religious leaders in Israel kept within the limits of the above-stated rules regarding the Abrogation of Laws. In the seclusion of their ghetto life, and under the oppression and persecution which they had to endure, the Jews felt neither the necessity nor the desire to abrogate any of the sacred laws and customs inherited from their forefathers. The teachers were in general inclined rather to increase than to diminish the burden of the law. From the time, however, when in most of the civilized countries the Jews began to enjoy the blessings of emancipation and to participate in the modern culture of the world, the necessity for abrogating some of their ancestral laws and customs which were not compatible with their new circumstances became more and more apparent. Not having, as heretofore, their own judicature, the civil law of the Pentateuch, so elaborately developed in the Talmud and in the rabbinical codes, was of necessity set aside. In this respect even the most conservative willingly acquiesced in its abrogation, following the principle laid down by Samuel, one of the most prominent teachers in the beginning of the third century, dina de-malkuta dina ("the civil law of the land in which we live is our law," Giṭ. 10b).Many of the ritual and ceremonial laws and customs fell of themselves into disuse; others were either abolished or modified by the various rabbinical conferences held during the last half century in Germany and in the United States. The authority of these conferences has been recognized by the reform Jews only. See Conferences, Rabbinical. Steinschneider, Polemische und Apologetische Literatur, pp. 322, 323.